Mom made these often, even though they were a traditional Easter cookie. These lemon ricotta cookies were my dad's favorite cookie. Dad just loved lemon flavored cookies. We enjoy these lemon cookies all year long. 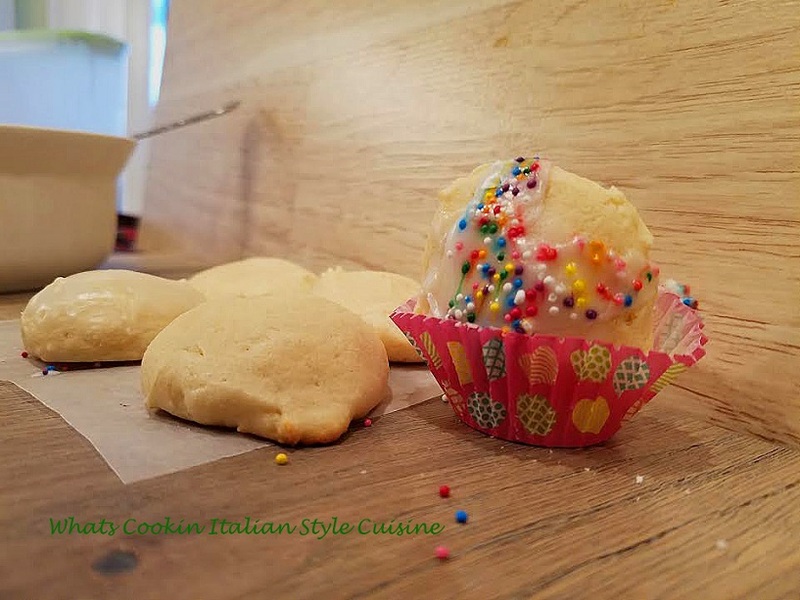 Mom's recipe for these lemon ricotta cookies is a basic delicious Italian cookie. They are pretty full proof even for the newest bakers out there. 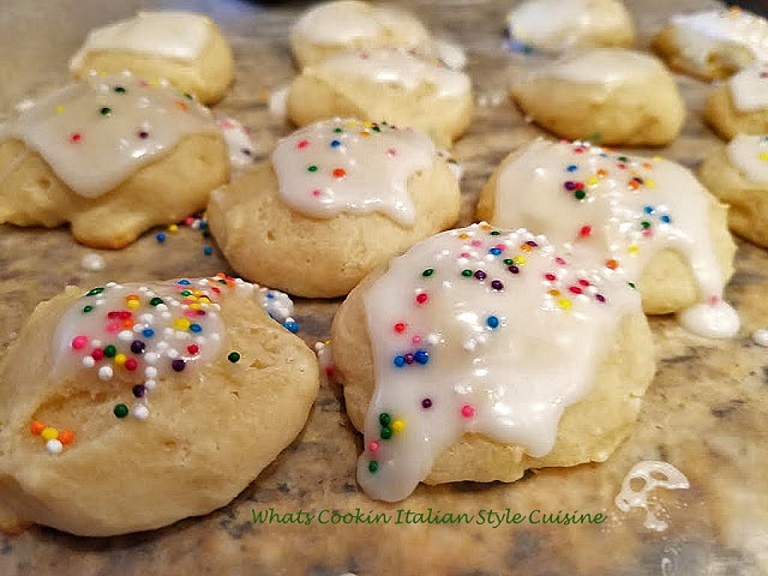 An Italian cookie that is so versatile as you can add any flavoring you like! Whether you love orange, just vanilla or even anisette flavoring, these are always a moist and tender delicious cookie. Mom always put so much love in her baking and cooking. No matter who came to visit, she would always have these cookies in the freezer, ready for company. She froze them plain and frosted them just before company came over, they always tasted like a fresh batch of cookies. If you coordinate the colors using sprinkles, you can make them dressed up to any holiday colored theme. I will give you more ideas below. Mom's lemon ricotta cookies are perfect for an Italian wedding tray. She would make white frosting with small sliver candies on top. Great for holiday, coordinate frosting colors to match the theme of whatever holiday, event or party your giving. I made blue for baby boy showers, pink for a girl and even yellow if you aren't sure of the gender to reveal. Just get creative and match any color theme for parties and events. I even did red white and blue glitter sugars for the 4th of July once. Great for giving as a gift as they travel well also. Mom made these often and they were one of my dad's favorite cookies. I usually don't change these up unless I am making a wedding tray of cookies. That's about the only time I use this simple basic batter to make all kinds of flavors. Our family is all diehard lemon fans. A wedding tray looks great with colored sugars to match the bridal party dress theme! A lemony flavored cookie that is light and airy not dense. They even taste well overcooked which I have been known to forget the cookies baking in the oven when I start baking! Hope you enjoy her recipe. I thank mom in my prayers every day for teaching me her talents in cooking but nothing can compare to those days when she made these lemon ricotta cookies just for me. 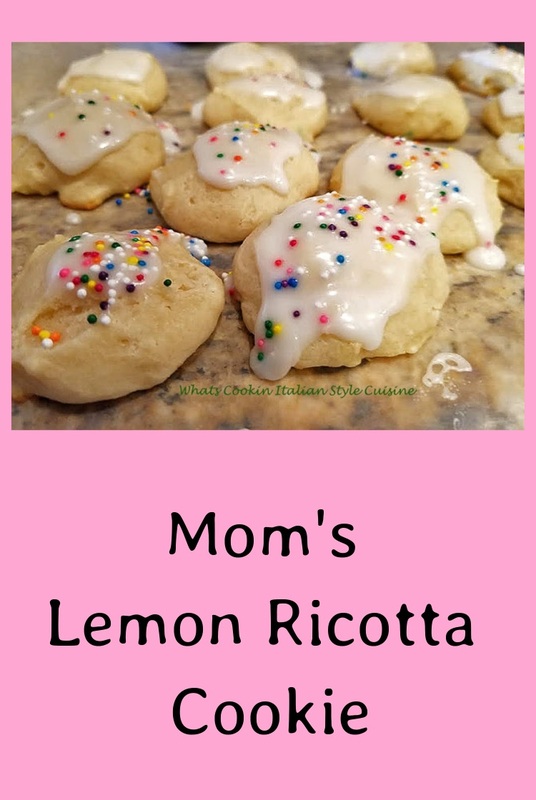 Mom's lemon ricotta cookies remain a family favorite for all our holiday baking and the many family get-togethers we have, these are the most asked for a cookie. 1/2 teaspoon lemon extract (I like more than the recipe called for so I add a little more) I have also made them with anisette or rum flavored both delicious. Cream the butter and sugar together for around 2 minutes. Add the ricotta, mix to blend. Add the eggs and stir till smooth. This is all done by hand no mixer. Add the flour, flavorings, and baking soda last folding in the peel. Heat oven to 350 degrees, I place these 2 inches apart dropped with a teaspoon on parchment paper. Bake until bottoms and edges begin to brown around 12 to 15 minutes. Mix the water a little at a time until the frosting runs a small stream, add peel if using around 1/2 teaspoon. 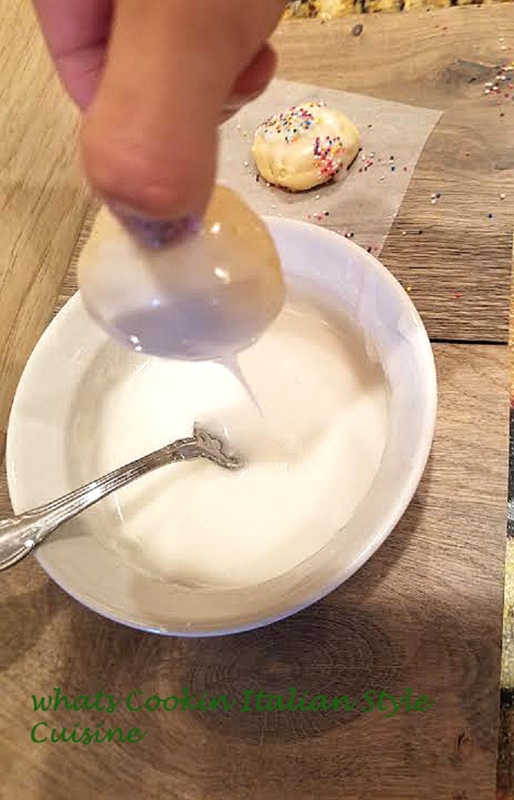 Dip hot cookies into the frosting and sprinkle with colored candies. I see these all over the web around the holidays. I need to add these to my baking list!! I love ricotta in anything. I'm sure these are delicious with the lemon flavor! Lemon sweets are so special. Your cookies sounds delicious! These look so pretty. I can't wait to make these. I'm loving the icing over.. These cookies do sound tasty! 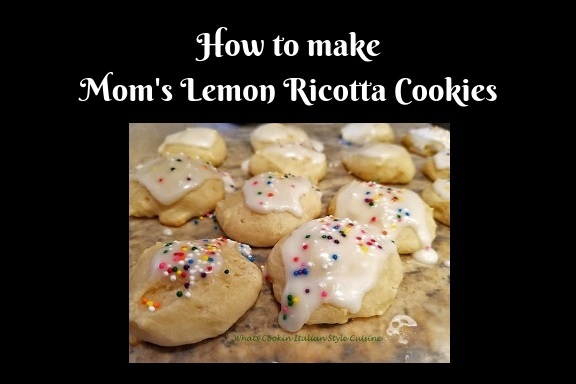 My grandmother used to make the best lemon ricotta cookies! But I have never tried to make them myself! These looks so delicious and I can't wait to try them!